Silver Long Ball Earring Hooks. 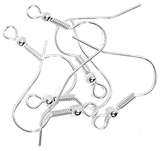 Trimits silver long ball earring hooks. Elegant earring hooks for jewellery making - pack of 6, enough to make 3 pairs of earrings.